Inspired by Joelle Harris’s Eco Print workshop on Saturday 11th March, this month we’re looking at using the materials that nature has given us! We’ve been experimenting with using natural materials for making paper and next Friday and Saturday we will be exploring eco dyeing and printing. We’re lucky to have Joelle with us at Craft Club on Friday March 10th. 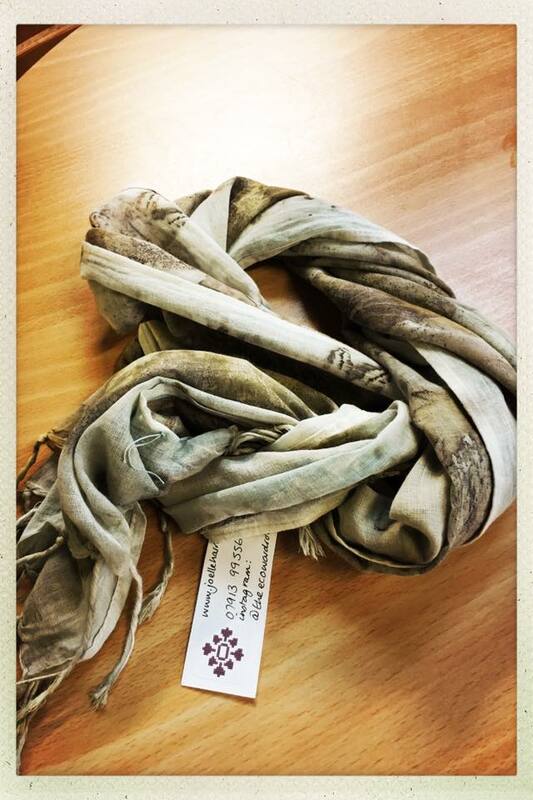 I’m really looking forward to this … I loved our experiments with natural dyeing last year, but Joelle has been studying and exploring this for 3 years as part of her textiles degree and has taken it on to a totally different level! She’ll be bringing lots more knowledge and experience of natural dyeing and sharing it with Craft Club….. I’ve seen her beautiful degree samples and it is truly amazing what can be done with natural dyes ….She’s got 50 wool samples from the mordanted and modified experiment with onion skin to bring with her! Images below of Joelle’s dyeing experiments. Joelle will sort out some mordanted wool samples for the Craft Clubbers … she needs to cover her costs on this so there will be an extra charge for materials on this weeks craft club. Joelle will then bring modifiers so that we can have a play with dyeing the wool, but again, if we can do some extra bits of preparation for this that would be good … remember this is Craft Club not a workshop! Firstly can people bring along any old pans to use for simmering up materials. blackberry leaves, pour boiling water over them the day before and leave to brew overnight. Alder cones is another one that is good for quick results. She could pre-prepare green willow twigs. Have we any other ideas plants in our gardens that may work?! If any Craft Clubbers are interested in Joelle’s Eco Print Workshop on Sat 11th March, we’re offering a 10% discount to Craft Clubbers so it’s £49.50 including your scarf and a homemade vegetarian lunch. Price includes all materials and a beatiful fairtrade cotton scarf for your finished design. Refreshments will be provided and a simple homecooked veggie lunch. Eco-Print, is the environmentally friendly way to create prints on fabric, using flowers and leaves, Joelle will show you how to achieve these beautiful prints and you will go home with printed samples on linen, cotton and silk as well as a beautiful fair-trade cotton scarf for you to wear or give as a gift. This a technique that you can carry on with at home with very little equipment once you have learnt the basic principles. Joelle now lives in North Lincolnshire where you will often find her wandering in the lanes collecting fallen leaves, gaining inspiration for her next project and rummaging in local charity shops in search of beautiful fabrics, she can never resist rescuing velvet, silk and fine linens. She recently graduated with a First Class Honours Degree in Textiles from Hull School of Art and Design. She explores and enjoys how diverse processes such as dye, print and hand stitch sit together in surprising ways. Protecting the natural environment is a major concern for Joelle, she explores ways to challenge the paradigm of industrial fashion and the use of dyes and chemicals that pollute rivers, by experimenting with dyes made from locally available materials with the aim of creating beautiful useful and wearable textiles. Joelle also writes a really interesting blog: The Eco Wardrobe Warrior, about sustainability issues, capsule wardrobes and sharing her upcycled clothing projects. If you love Joelle’s products, but don’t fancy the workshop, you can of course, just buy a scarf or lavendar bag instead! !